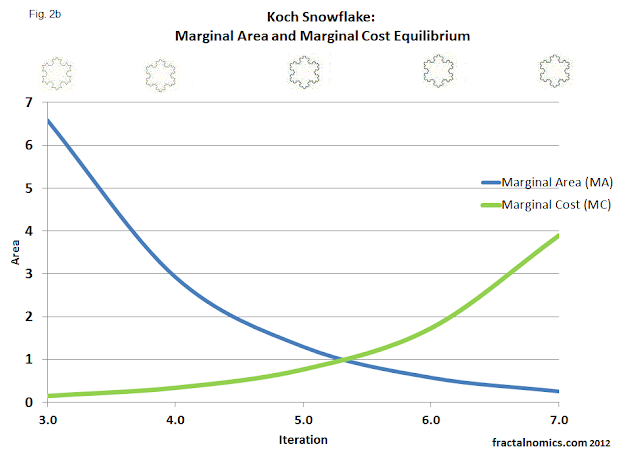 To demonstrate the increasing cost - in effort and time - at each iteration (see my first blog on marginal analysis and the fractal) to produce the fractal, I decided to use the the reciprocal and invert the Marginal Area, MA. 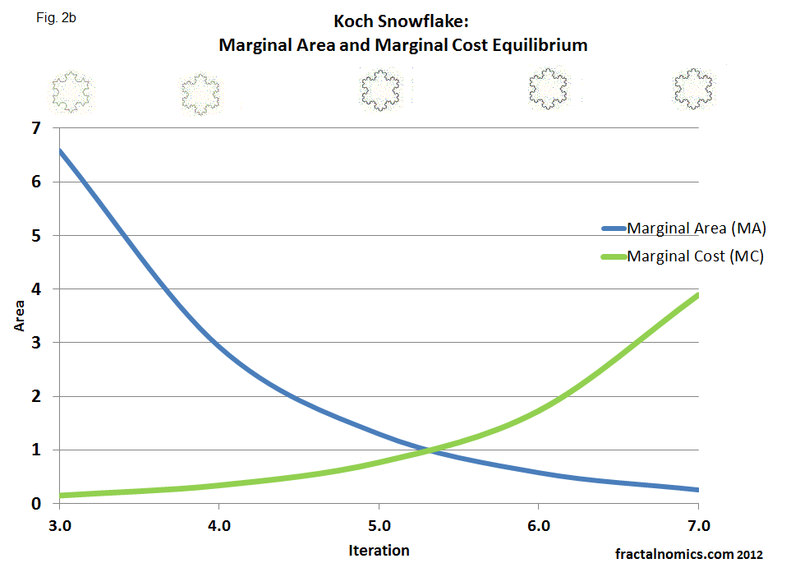 The rationale for this choice is based on: the more area to the snowflake, the more the cost. I am sure there are other ways of doing this, but I figured that this method is as simple and as easy as calculating the MC again, it should be okay. Fig. 2 shows the original MA TA diagram with the MC. One thing about computer generated fractals is that they appear to be produced with ease, we simply forget that they would not be viewable if it were not for the memory and processing power of our modern computer. 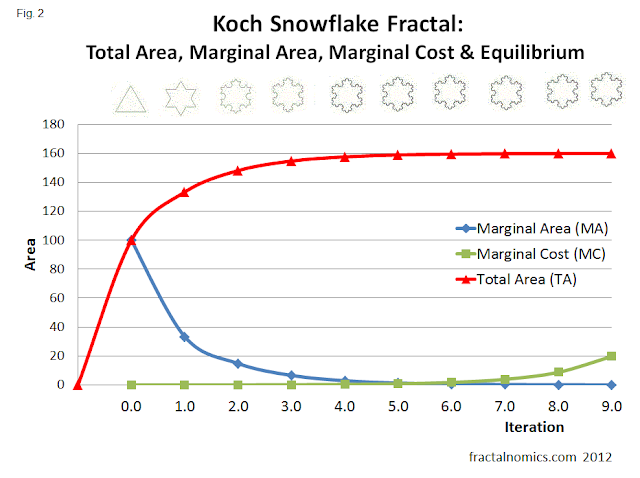 To see how complex and slow they are to draw one only has to take a pen and paper and have a go at drawing the Koch snowflake progression - step by step. It is easy from the beginning, but it progressively gets harder and harder with each iteration or level: there is a 'cost' in time, and it takes patience too - adding hundreds of triangles and rubbing out old lines. What we don't see when we use the modern computer to draw them is that they too will start to labour, and slow - after (around) the 8th iteration, and probably crash after the 12th . This all due to the added complexity at each iteration. 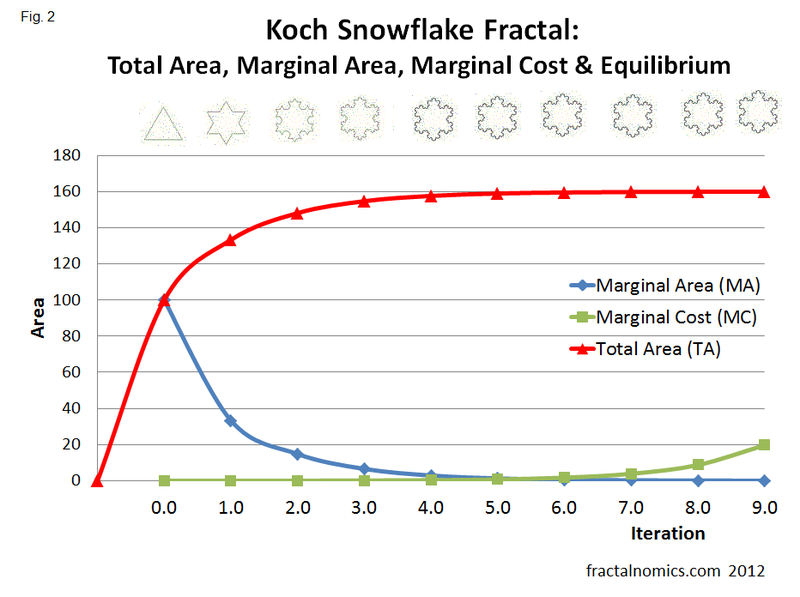 In my next entry I will analyse this fractal equilibrium. Figure 2b shows the MC MA equilibrium in closeup.